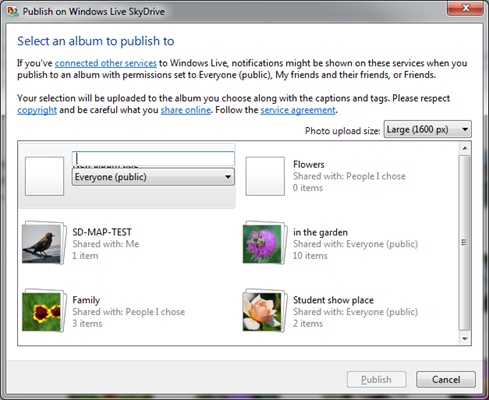 How do I upload photos to SkyDrive using Windows Live Photo Gallery? SkyDrive is your free storage and sharing location provided by Windows Live. A number of applications “know” how to upload to SkyDrive and make the process very easy. Windows Live Photo Gallery is one of those programs. To tell Photo Gallery about your SkyDrive, simply sign in to Photo Gallery. Over on the upper right side there is a Sign in link. 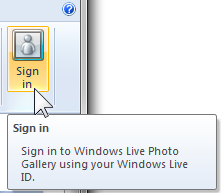 Click Sign in, then sign in with your Windows Live ID. Once signed in, Photo Gallery will remember and you need not sign in each time. To upload photos, select them – just click the thumbnail image. If you wish to select more than one, hold down the Ctrl key while clicking on the desired thumbnails. If you have a group of photos in consecutive order you can click the first one, then hold down the Shift key and click the last one. To select all the photos shown in the gallery click Select all on the Ribbon with the Home tab selected (or hold down the Ctrl key and press A ). Be careful with that. This will select thumbnails that are scrolled off the view. Selected thumbnails will be highlighted so you can see which ones are selected. There are a number of choices to make in this dialog. Note the Photo upload size – the default is “Large (1600 px)”. Click the down arrowhead for other size options. Note that you can also select Original to upload the photos in their full size. The option Medium (600 px) is ok for photos that are meant only for online viewing. When you select other than Original your photos will be scaled down if the horizontal or vertical picture dimension is larger that the number shown. Smaller photos will not be resized. In the main area of the dialog you can select one of your existing albums on the SkyDrive, you may need to scroll down if you have many. The default is to create a new album. Note the text entry box w ith the flashing cursor. Just type the name that you want to assign to the new album. For a new album, there is also a sharing selector. You can specify sharing here. Of course, you can change that later in SkyDrive. When you have made your choices, click the Publish button which will now be available in the lower right of the dialog. A dialog will show the progress of the upload process. Remember that this may take some time depending on the number and size of the photos selected. It really is that simple. You can upload to an existing album or create a new one right from Windows Live Photo Gallery. This entry was posted in Photo Gallery, SkyDrive and tagged albums, create album, Photo Gallery, photos, SkyDrive, upload photos by Ludwig. Bookmark the permalink. How can photos be uploaded to SkyDrive in a way that will mirror the folder structure n my hard drive? Must this be one one folder at a time, or is there a way to select multiple (or all) folders with the result that each folder will become a separate album in SkyDrive? Presently the way to create a folder structure on SkyDrive is to create the empty folders and sub-folders (in SkyDrive). Then use the drag and drop option to upload the photos into those folders. A new update to SkyDrive is expected to be released shortly (in May 2012) that may make the process easier. I will post a note in This ‘n That as soon as I have the information. Thanks – that is a bit cumbersome. Hopefully, the update will help. I did try creating a network drive for my SkyDrive account and synching the files using GoodSynch Pro which uploaded the files to my SkyDrive account. The folder structure was created, but for whatever reason, all of the photos were displayed as icons rather than thumbnails. The folders were defined as Documents, but changing them to Photos made no difference. Ay ideas why this should be the case, and if I can do anything to get them to display properly using the Synching program? SkyDrive does not like any photos that are not in JPG format, that might be your problem. I have not used GoodSynch Pro so I have no information on that. We are both hoping that the new SkyDrive version will solve all or most of this issues. There is one dark cloud: Integration of SkyDrive into Windows Explorer – so it looks like any other drive or folder – is promised for Windows 8. No word on Windows 7. What is the emoticon for keeping your fingers crossed? How do you open pics from skydrive? SkyDrive is rather different and the answers depend on just want you need to do. Can you be more specific with this question? Do you just want to look at them or download them? You you want to share them with someone else? I want to lok at them, and they are jpg files. I went through the long process of uploading group by group through Photo Gallary. Just wish there were a better way. Well, I tried opening pictures from SkyDrive directly from Live Photo Gallery, but there was no visible option to. How can I do that, or do I have to download them for the time being? what to do if the upload items don’t want to load because of the name? Not sure I fully understand the question. If you have a file name conflict you can just rename your file and try the upload again. Please let me know more details, I will try and find a good answer. To add photos to your Shutterfly album log into you Shutterfly site. Click Add. You can upload from your computer. If your photos are only on OneDrive, download them first. Extract the photos from a downloaded zip file before uploading them to Shutterfly.